Tırmanışta bilek ve parmakları güçlendirmek. The musculature of the forearms is some of the most complex in the body. For example, at first blush it seems that the finger flexor muscles are almost single-handedly (aren’t I punny) responsible for securing a tight grip to the rock. Consequently, exercises that target the finger flexor muscles—such as the fingerboard, HIT System, campus board, etc.—are the focus of most climbers’ training programs. Maximizing your strength and increasing your resistance to injury, however, demands that you also train the muscles that extend the fingers and wrist. Here’s why. The finger flexors suffer from a functional insufficiency in that they are much weaker when the wrist is flexed and the muscles are short. As an experiment, flex your wrist as much as possible (wrist angle around 90 degrees) and pinch your middle finger as hard as possible against the thumb. It’s hard to create much force, right? Now, while still pressing your middle finger against the thumb, slowly extend your wrist to a straight position and then an over-extended position. What did you notice? If you tried to squeeze hard throughout this range of motion, you likely discovered that your finger force increases as the wrist extends. Biomechanically, there are a couple of reasons that finger strength is greater with an extended wrist position. First, muscles can contract more forcefully when they are elongated, as the finger flexors are with an extended wrist position. More interesting, however, is how the fingers naturally assume a hook-like position when the wrist is over-extended. Try it right now—over-extend your wrist and you’ll see the meat hooks revealed! Now you know why fatiguing climbers lift their elbows into the chicken-wing position—it puts their wrist into a position that enables their pumped forearms to grip a little longer. Done chronically, however, such chicken winging stresses the extensor muscles and puts added stress on the tendon pulleys in the fingers. The result can be gradual onset of lateral epicondylitis and/or finger tendon problems. The training “fix,” then, is to dedicate a modest amount of time to training the finger/wrist extensor muscles. No, you can’t just extend your fingers against a rubber band and call it done. You need to do some serious training in multiple ways, just as you train the finger flexors in a comprehensive manner! It’s paramount to train the wrist in both a neutral and extended position, as well as in a wide pinch grip position—this is the single most overlooked and important position to train it. Here the best exercises to strength the finger/wrist extensor muscles: Reverse Wrist Curls (with a dumbbell), Wide Pinches with Wrist Extension (detailed below), Pronator Isolation, and finger extension against a rubber band. Do one set of each exercise (with a light resistance) as part of your warm-up for climbing (or training), and then do two or three more sets with higher resistance toward the end of your workout. Warming up the finger extensors with Powerfingers. Okay, let me get this one out of the way first, as rubber-band finger extensor training is quite popular. Interestingly, use of a rubber band (or similar) to extend your fingers against is sufficient only for the purposes of warm-up, beginner strength training, and rehabilitation from injury. I recommend use of Powerfingers (see photo) to warm up before climbing and in advance of the more stressful finger extensors exercises. Extend your fingers against the Powerfingers (or a rubber band) for 15 to 25 repetitions. 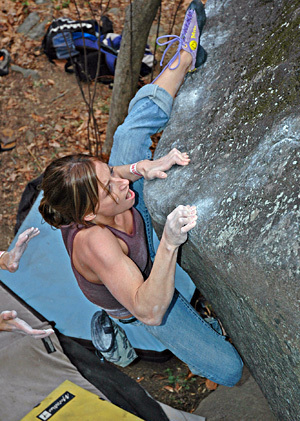 If strength training (rather than warming up), do a second and third set with higher resistance (Powerfingers come in 5 different resistances); although use of the Wide Pinch Wrist Extension (below) and Reverse Wrist Curl exercises are essential to develop the higher levels of extensor strength and wrist stabilization needed for high-end climbing. This novel exercise is absolutely essential, as it strengthens the extensor muscles with the fingers fully extended as they are in holding onto open-hand edges & pockets and wide pinch holds when you are climbing. It may seem like a small distinction, but the wrist extensors function a bit differently when the fingers are straight (extended) compared with when the fingers are flexed, as in crimping or holding a dumbbell (as in doing a Reverse Wrist Curl). Until there’s a commercially available device for training the wide pinch grip, you’ll need to kludge something that will work. Screwing together two or three pieces of 2×4 wood blocks is a cheap, effective solution. 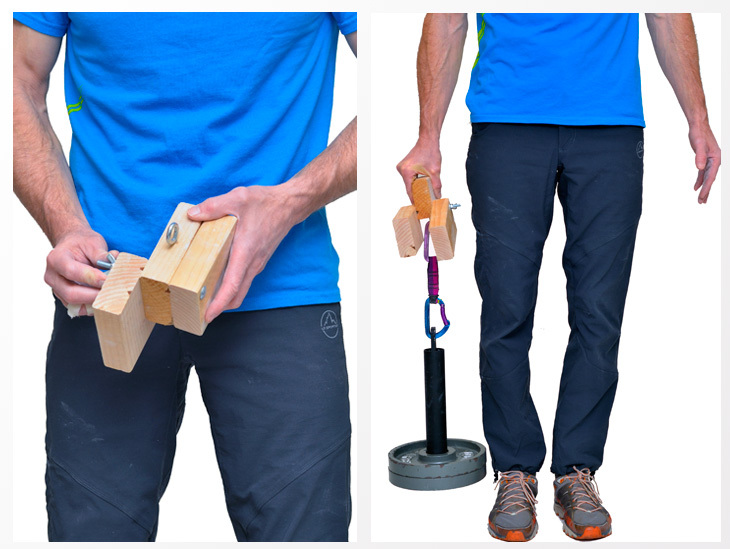 (Scroll down to see how to make an adjustable-width pinch-block trainer in 15 minutes!) Another option is pinching a thick bumper weight plate. Anyway, the exercise is straightforward: Standing upright with good posture, pinch the wood block or bumper plate with a straight arm and extended wrist; hold this position for ten to thirty seconds. Initially, I suggest training for endurance, which will require a light weight that allows a full thirty-second hold. Do three with each hand with at least a minute rest in between. 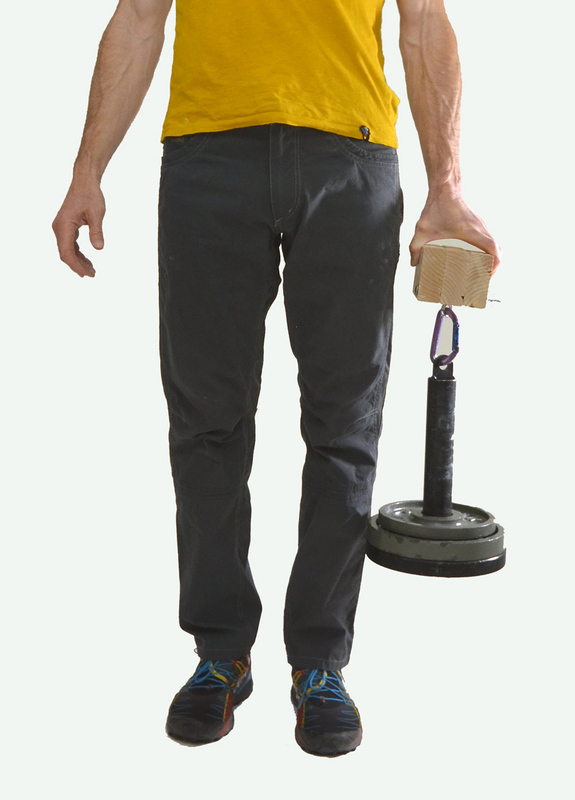 Longer term, consider using a heavier weight that allows only a ten-second hold. In this case, do three consecutive ten-second pinches with the same hand, resting only thirty seconds between each one. Do a total of three sets of three reps with each hand, resting for about three minutes between sets. The must-do exercise! Wrist extension training with wood block and bumper plate pinch. Training Tip: While pinching in an overhead arm position (possible with some fingerboard designs) is a good pinch-training exercise, hanging from an overhead arm position does not engage the wrist stabilizers in the same (ideal) way as in doing the exercise shown above. An optimal pinch and extensor training program should include pinch training with both arm positions. Watch this T4C video for a detailed explanation of wrist stabilizer function and training. Make a homemade adjustable-thickness pinch block in three easy steps: 1. Cut three 4.5-inch long pieces of 2×4. 2. Stack the blocks and drill one corner to install a 6″ lag bolt with wing nut. 3. Install an eye bolt screw into the middle pinch block. 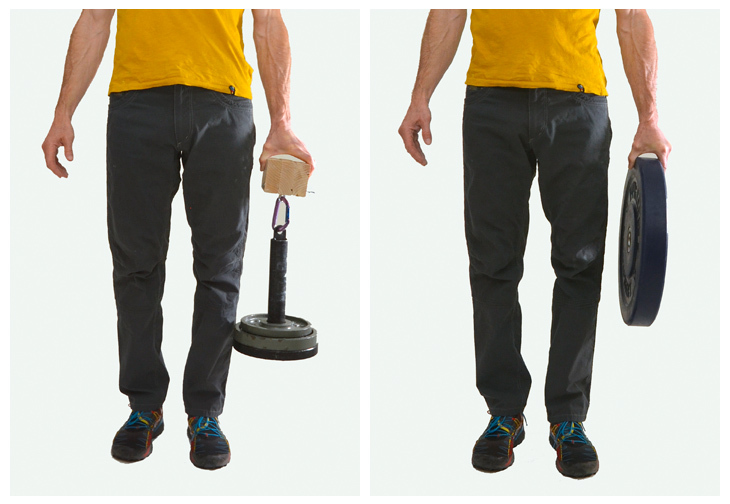 Now, begin training three different pinch widths…and get strong!